Coco Crisp didn't look down to third base to see how deep Travis Metcalf was playing. It didn't matter. In the third inning last night, with the Red Sox already ahead, 2-0, Crisp decided he was going to start something. He was going to use his speed to get on base. He was the No. 9 hitter in the order but he was leading off the inning. Crisp bunted and raced to first for a single, starting a four-run inning that essentially won the game for the Sox. It was the smallest hit in length, but one of the biggest of the night for the Sox, who beat the Texas Rangers, 8-4, in a game in which Jon Lester dominated again. Kevin Youkilis, batting cleanup, and Jason Bay, the No. 5 hitter, smacked two-run doubles in that inning after Dustin Pedroia doubled and David Ortiz was walked intentionally following Crisp's bunt single. In a lineup without not only Manny Ramírez, but now Mike Lowell, Youkilis and Bay are going to have to be big run producers, and they were, making Texas starter Luis Mendoza, a former Sox farmhand, pay for elevating his pitches. "I just did it," said Crisp, when asked to explain his strategy. "I'm just trying to get on base. This has been a fun two games for us and we're doing things and scoring and winning in different ways. A lot of guys [were] great tonight and the last couple of nights. It's just a lot of fun when things come together and you win." The Red Sox, who have scored 27 runs in their last two games, made it tougher than they wanted after Lester exited after 7 1/3 innings, as Mike Timlin allowed a three-run homer to Milton Bradley in the eighth to make it 8-4. Justin Masterson came on for the ninth and allowed the first two batters to reach, then squirmed out of the jam by starting a nifty 1-6-3 double play, and ending the game by inducing a foul pop to Youkilis at first. But over the last two nights, the Sox have taken advantage of the pitching-challenged Rangers. Texas starters have failed to last more than five innings in each of their last five games. The Rangers can hit, they can battle, but that's the best that can be said for a team that has given up a major league-high 733 runs. Youkilis, who had three doubles for the first time in is career, has been seeing the ball well. 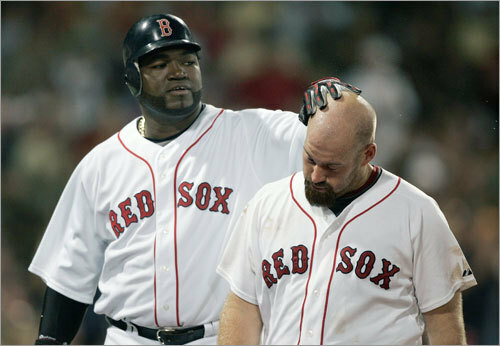 "He's been unreal," said Bay of Youkilis. "He's got a lot more pop than I've given him credit for. With Lowell out, he's the guy who can step up and really carry us. He's been fun to watch." Bay added, "It's just fun to come up to the plate and have people on base all the time. I think this ballpark is really conducive to a righthanded hitter. I've been here like 12 days and I feel as if I've been here all year. It's really felt comfortable for me." Youkilis, who appears to be the long-range third baseman with Lowell sidelined with an oblique strain, had all three of his doubles by the fifth inning. The Sox scored twice in the second inning, as Youkilis doubled, advanced to third on Bay's single, and scored on an errant throw on Bay's steal of second by catcher Jarrod Saltalamacchia. Bay scored on Sean Casey's ground out. Youkilis isn't awed by batting cleanup. "I just go up and try to get hits or a walk, get on base," he said. "You can't worry about where you hit. When you go up there it's not like they put a number on you saying, 'You're hitting fourth today.' You go up, you have the same number on your back, you have to have the same at-bats." The Sox tacked on two runs in the fifth on Jed Lowrie's double to left-center on a pretty inside-out swing. Lester improved to 11-4, recorded his 15th quality start, and has gone at least seven innings in each of his last seven starts. He has won eight of his last 12 starts and has lost only once (his last outing, 5-3 to the White Sox) in that span. In fact, last week's loss in Chicago was the first time he'd suffered a loss in 14 career starts in which he'd pitched at least seven innings. "I thought he was tremendous," said Sox manager Terry Francona. "I thought he had power on his two-seamer and his cutter. We set out to win tonight and we did. We made it more interesting than we needed to." Lester allowed a solo homer to Ian Kinsler with one out in the eighth to ruin his shutout bid. Lester was taken out after 108 pitches with one out in the eighth and two runners on base. He left to a standing ovation. One scout at the game felt that Lester had tremendous command, and worked both sides of the plate to perfection. "He's becoming one of the premier lefthanders in the game," the scout said. "He's starting to be one of those guys the team can depend on every time he pitches. Now he's getting dominating. He's reminding people of a younger Andy Pettitte every time he goes out there. It's great to watch young pitchers develop and blossom, and this kid has done that before our very eyes after all he's been through with the cancer. The Red Sox have a No. 1 lefthanded starter. They're hard to find."